There have been plenty of product launches at the Excel Centre this week as part of the London Boat Show, but few can claim to be as truly cutting edge as the Radinn electric wakeboard. The brainchild of Swedish entrepreneur Philip Werner, the Wakejet Cruise allows wakeboarders to forgo the tow rope and sportsboat altogether. Following an official unveiling at Cannes last year, the futuristic boards are getting their UK launch on the Landau UK stand (D021) at the London Boat Show and are sure to turn heads among watersports fans and adrenaline junkies alike. Powered by an electric motor and jet thrusters, the Wakejet Cruise can carry riders weighing up to 130kgs (20 stone) and hit a top speed of 29mph (25 knots). The composite construction of aluminium, carbon fibre and Kevlar keeps weight down to a portable 29kgs, and although the lithium-ion battery can last up to 45 minutes between charges, this dips to 20 mins when going flat out. Key features include a smartphone app that allow you to restrict the top speed and acceleration when beginners or children are trying it out for the first time. 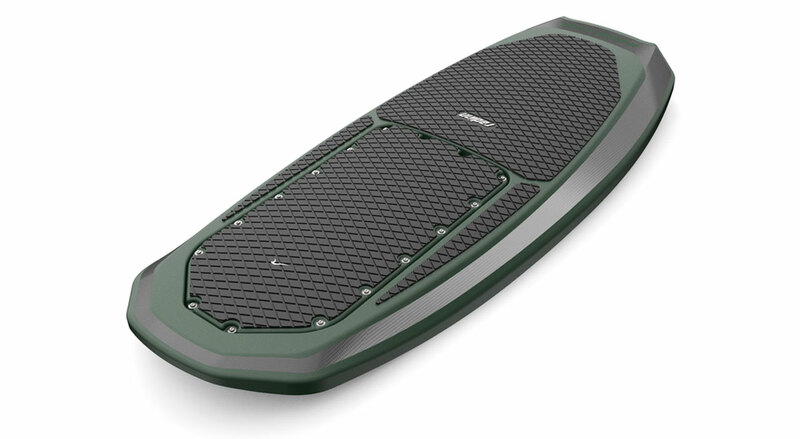 Prices start at €15,000 and the Wakejet Cruise boards are available in a choice of three colours – Amazon Green, Pacific Blue or Glacier White. To get an idea of what the Radinn Wakejet Cruise electric wakeboard can do, click on the video above.